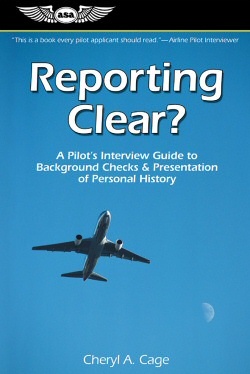 A pilot's step-by-step guide to conducting their own background check and the proper presentation of personal history during the interview process. What exactly is the Pilot Records Improvement Act? How does this Act impact pilots? Why are the airlines interested in every area of the pilot’s background? What can pilots do to lower concern about a problem area? What is an addendum, when do pilots need one, and how do they write one? Cheryl gives you guidance on how to discuss negatives (we all have them!) in your history. Learn what "problem area" paperwork you must provide to an interviewer. She covers the most common mistakes made by pilots and gives specific advice on how to confidently and concisely present background information to an interviewer! ISBN 978-1-56027-509-1 Specs Softcover, 6" x 9", indexed, 95 pages.